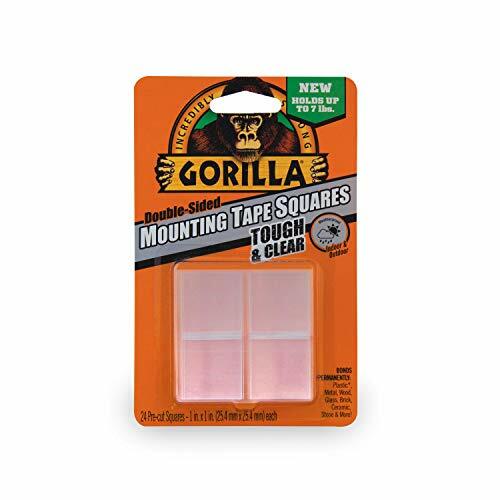 Gorilla tough & clear mounting tape squares are clear, double-sided, 1 inch squares of tape that mount in an instant for a permanent, weatherproof bond. These crystal clear squares won't yellow over time, and hold up to 7 pounds! 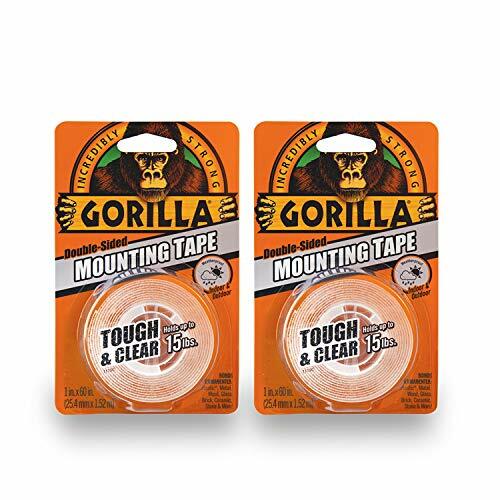 Gorilla tough & clear mounting tape squares are perfect for indoor and outdoor projects and stick to smooth and Rough surfaces. 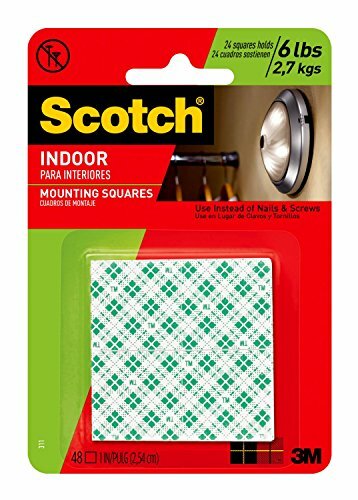 Completing DIY projects is easy with these pre-cut, double-sided squares. Mount, build and repair! bonds: plastic, metal, wood, glass, brick, ceramic, stone, drywall & more. 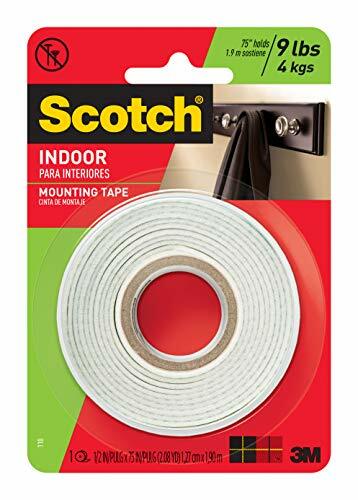 Scotch Indoor Mounting Tape 110/DC. 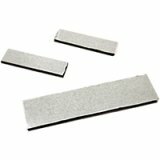 A double-coated foam tape that adheres and conforms to a variety of surfaces. 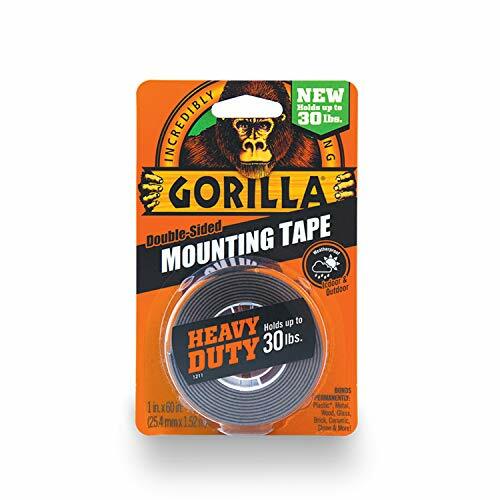 Faster, safer, and more versatile than screws or nails, this general purpose mounting tape is designed for attaching items up to five pounds to virtually any smooth wall or surface. 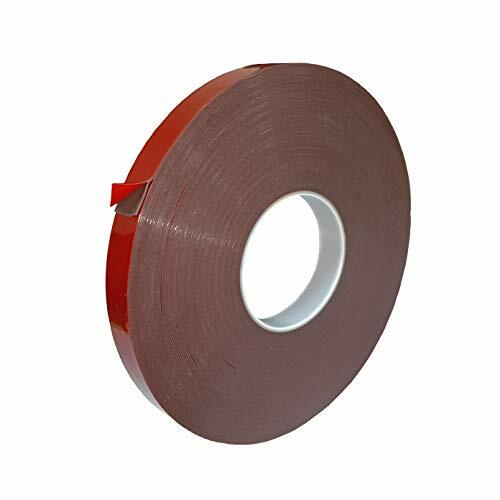 Now, you don't need bolts, screws or nails as this tape can work both outdoor and indoor on clean surfaces such as wood, metal, concrete wall, plastic and even fabric. 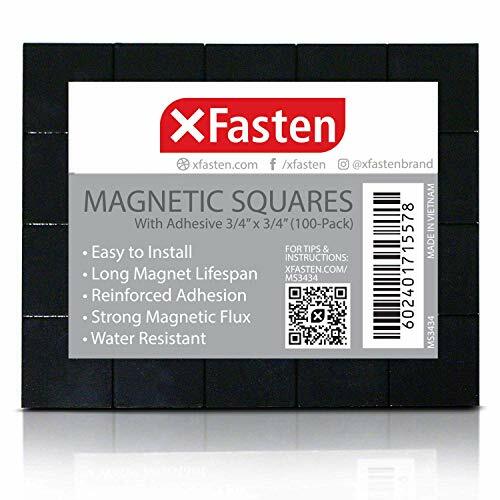 It also offers a high initial bonding strength, which means that the adhesive neatly sticks into the surface without any mess. With a length of 450", this roll gives you the biggest bang for your buck. It is 0.045" thick and has a width of 1". 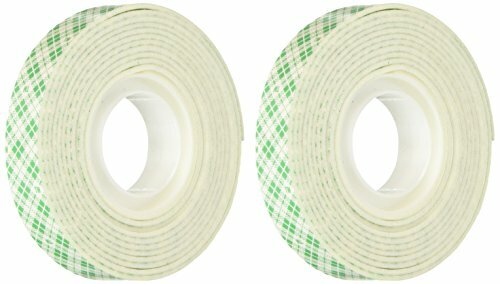 XFasten Extreme Heavy Duty Mounting Tape is waterproof and can hold up to 5 lbs of mass per square inch of tape. 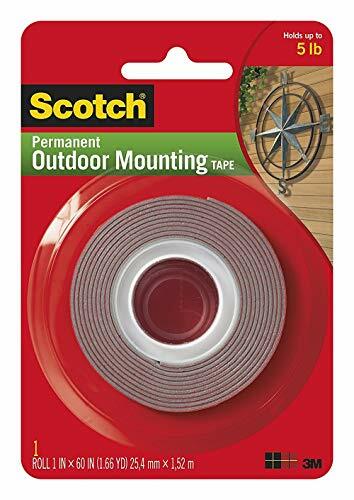 Weather-resistant double sided mounting tape that holds items securely and rigidly both indoor and outdoor. 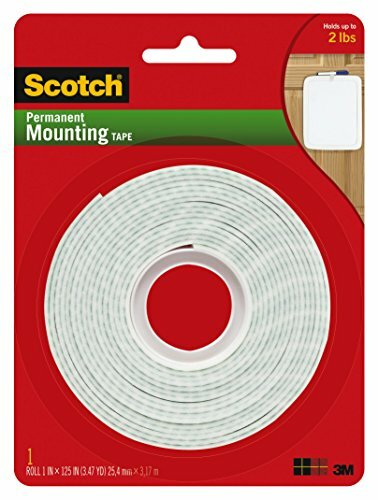 Ideal clear mounting tape replacement for screws, nails, bolts to mount kitchen and bathroom accessories and decors. 2 x high tensile strength means you will finally win the battle over the ever-migrating area rug / pad edge and corner binding - even in super high traffic locations such as the kitchen or staircase. Tears by hand and removable without glue residue. Thin adhesion grip works indoor / outdoor on smooth / rough surfaces and on all flooring types, including: hardwood, tile, and laminate. Additional uses: - two way adhesive film to protect furniture by using as a cat deterrent - anti scratch sticker - woodworking accessory - hold vacuum robot recharging dock station in place - secure a memory foam mattress topper - hang posters on a wall, or other mounting tasks - bed bug blocker - design costumes and hem back pants (temporarily velcro) - keep silverware trays from sliding around in the drawer - stick things to tag board or cardboard for school projects - attach two separate curtains together - repair minor things such as lamp shades and paper products - hold down wood on a cnc router, kid mat, or stair tread - keep toothbrush cup from falling over in the medicine cabinet (waterproof) - secure burlap to an aisle runner for an outside wedding - hold a soap dispenser in place so it doesn't tip over - floor underlayment industrial strength construction installation - prevent elderly slipping, strongest non slip stay protection solution - a must-have tool for every safety-conscious home owner - 3d filament thick printing aid - perfect gift for the holidays. We offer an unparalleled customer satisfaction promise: if you're not absolutely happy with your strong, non skid, solid stick tape, we will replace it or refund your money. 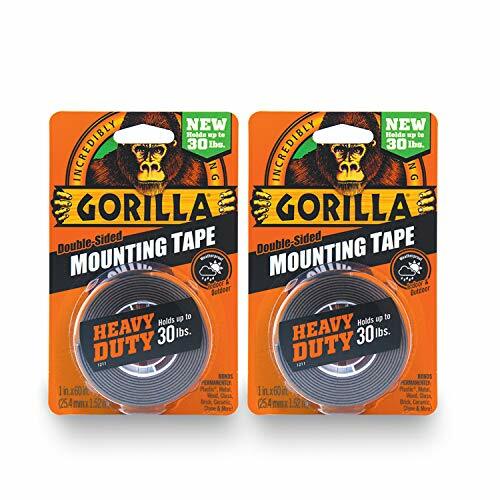 Bottom line: if you want to have peace of mind and certainty that you are purchasing the very best tape on the market with superior adhesive on both sides for the strongest and longest hold, then there is absolutely no risk for you to purchase today. Not intended for skin or face application. It's 2.5 inches wide for maximum area coverage. Ideal for kid / elderly slipping safety, woodworking, underlayment installation, and construction. Optimal weight and pliability, the best heavy duty tape on the market is easy to handle, apply, and removable with no residue. Order now to receive an email with your eBook download with the Top 10 Tape Hacks - Quick Start Guide. So watch your inbox! MULTI-UNIT DISCOUNTS! Up to 3 FREE with today's order. Scroll down to the Special Offers & Product Promotions area below. 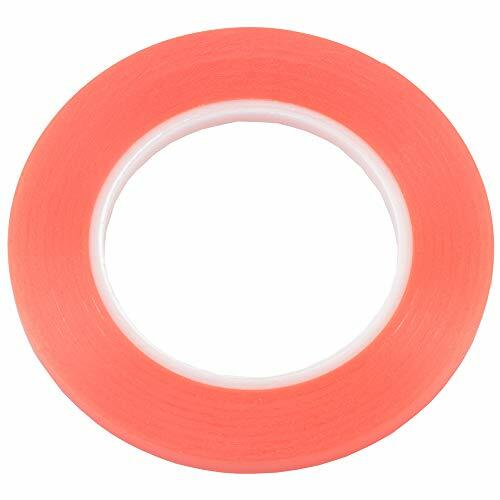 The sponge tape is made of PE foam, have strong adhesion, good retention, anti-ultraviolet, temperature, water, solvent, flame and rub resistant. Sticky in double sides, easy to stick and tear, stickiness can be maintained for a long time. The mounting foam tape roll fits for many occasions, such as car signs, nameplates, signs, doors and windows decoration, scrapbooking, cards making, etc. 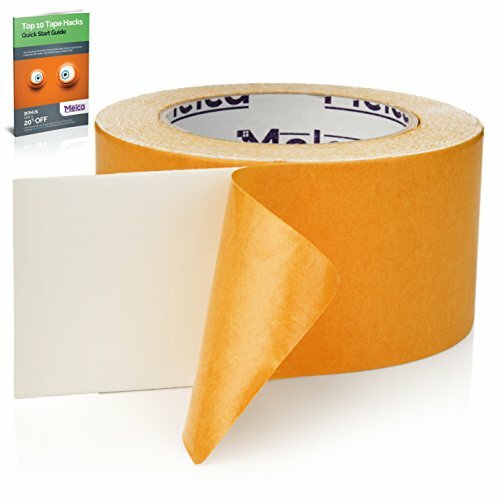 This adhesive bonds well to most surfaces makes it a good universal mounting tape. 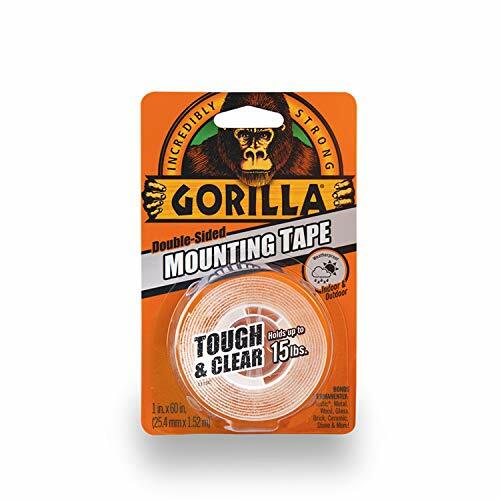 ***AVOID FINGERPRINTS ON TAPE FOR BETTER HOLDING***; LLP Acrylic Double Sided Mounting Tape is a heavy duty mounting tape for industrial-grade mountings, crystal clear and solid-putty consistency makes it strong, extremely sticky while still being easy to handle. 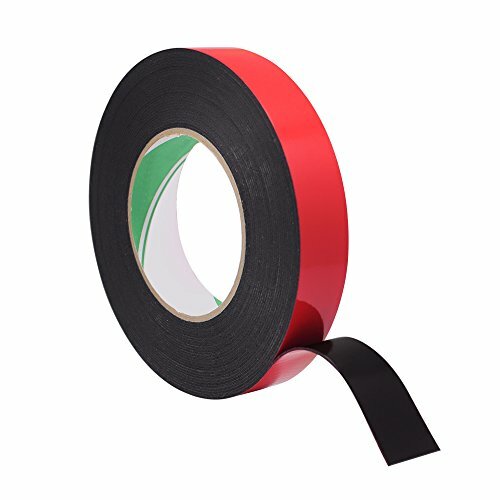 LLP Acrylic Mounting Adhesive Tape will not melt or soften easily even after months of installation or on conditions with high temperature and humidity. 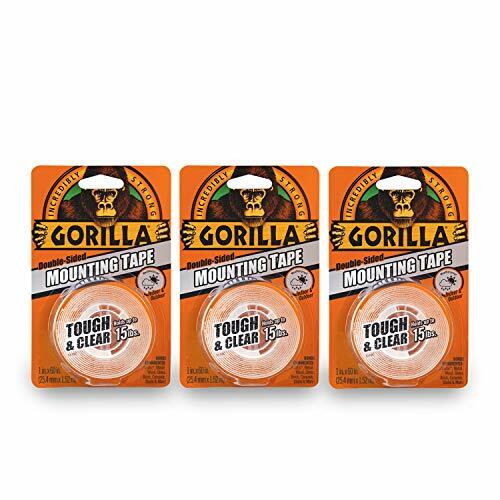 It is recommended to maximize the surface area of application, apply as much tape as possible to increase the tape's STABILITY & STRENGTH. This tape can be compressed that it can fill the gaps between uneven surfaces, making these adhesive dots the best tool for corrugated surfaces. Also, it can be applied and removed later, ideal for students, renters, teachers and other professionals who are using the space temporarily for the mounted objects. Suitable to be used: Metal, Glass, Ceramic, Paper, Almost all good condition walls can be used except for those walls, which are cracked, wet and wrinkled. The life time of tape could be doubled if the walls can be wiped the wet and dust before sticking. All trinkets, mobile rack, trash can, perfume, etc. on your car can be always stayed in position no matter how bumpy the road is, making your stuff safe and on position. If you need to remove Acrylic mounting tape, it's better to remove it within 72 hours and after 72 hours, the tape may take more time for you to remove. Except for below accessories (cover for wall paintings), the tape can be used at home for lighter or heavier parts in bathroom, living room, bed room, kitchen and etc. 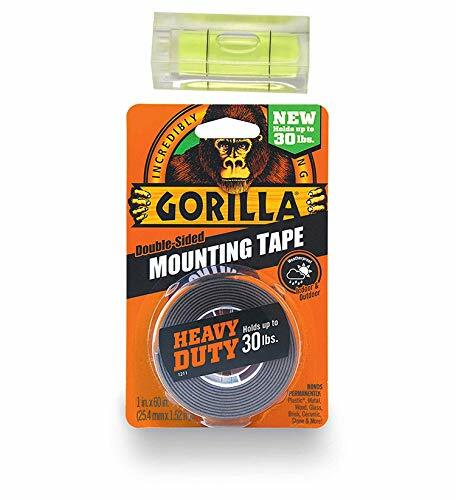 INSTALLATION: WATCH VIDEOS underneath before installing this heavy duty Acrylic Mounting Tape, it will help to install the tape properly. If you need to hang heavy stuff, 24 hours needed so that the bonding surfaces can be permeated into each other; give a press during installation for strong holding. If you need instant Double Sided Tape, search LLP PET, which is suitable to light stuff, repair & instant adhesive. APPLICATION: Strong bonding strength that can withstand moderate to heavy strength and it is safe for glass, wood, metal, concrete,marble, tiles, bricks, plastic, moldings on automotive, car registration plates, name plates, address plaques, signs, car holders, tile, big glass/aluminum/plastic installation, refitting vehicle for body kit/front bumper/rear bumper/side skirt, big home appliance panel repair, mosquito/bug screen, metal mailbox, mirrors, hangers and so on. CONSTRUCTION: Avoid FINGERPRINTS on TAPE for STRONG HOLDING. Tough industrial grade mounting tape that is rated to hold 5-20 pounds of mass weight per square inch with double-sided adhension; weather-proof adhesive empowers home and enterprise owner to have tight bonding; wall safe adhesive enables apartment renters, students, homeowners, teachers and office workers to temporarily post various objects on walls & gray acrylic tape resists yellowing & UV exposures. 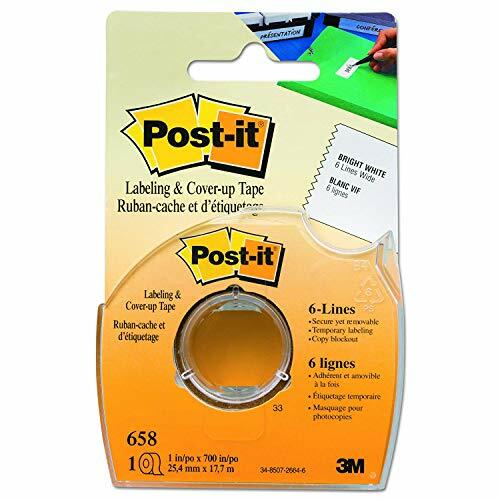 FEATURES: The double-sided tape adhesive is designed to resist curling, making the installation process fast, easy and mess-free. It resists extreme temperature, moisture, humidity, UV, etc, and anti-dust. No objectionable odor and nontoxic, tasteless, environment protection and no discoloration. It comes at true 108 feet in total length per roll, affordable and very competitive at the fraction of cost compared to most brands on Amazon based on sizes and quality. 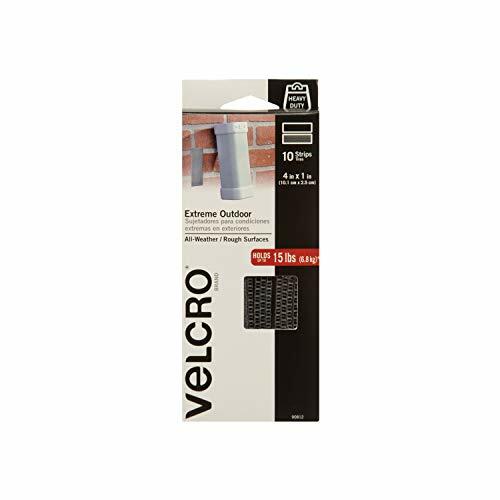 EASY REMOVAL AND RESIDUE-FREE: The adhesive is extremely strong but is still easy to remove, cut and peel by hand. We have tried and tested it in various materials like wood, concrete, tile, vinyl, leather, marble and hardwood floors to ensure that it is indeed residue/mess free and it will not cause damage if ever it is removed after a long time. Product Description Features:High temperature resistant 100% New High quality OEM part It is great items for repair of the LCD Display Inevitable adhesive which holds the touch screen or LCD screen display in position. For Repair Cell Phone HTC ,Samsung Galaxy ,Motorola ....... , for IPHONE IPAD 1,2,3 IPOD TOUCH . All Screen Replacement Work Size : width 2mm double-sided tape The length is about 25 meters Thickness 0.2mm. adhesive tape This product is the relation between the industrial base material and double-sided tape, the adhesive are high quality acrylic glue which has excellent high temperature resistant, good adhesive, climate resistant, oil resistant, waterproof .anti-vibration, excellent flexibility and is easy to tear. Please store in dry and well-ventilated place. We can cut as your request width, please contact, more quanity get more discount Please feel free to take several seconds to check the picture if meet your request, thanks. Suitable for several Smartphone, Tablet and Laptop Models of the following manufacturers: iPhone iPad Samsung Huawei Sony Xiaomi LG Nokia Motorola Asus Lenovo BlackBerry Blu Microsoft Nexus HTC Google Figo Honor LeEco Archos Emporia Garmin Intex NEC Palm Sonim Sagem Acer OPPO ONEPLUS MEIZU Alcatel ZTE Xolo Micromax Gionee Vivo HP Verykool Maxwest Plum Vertu Yota Wiko PLEASE CHECK if these tools are compatible for your model and planned repair job. This roll of double sided Ultra strong adhesive Sticky Glue tape for carrying out repairs to your cell Phone repair. The 25 meter length means that you'll have plenty of tape for multiple repairs. 100% Satisfaction Guarantee:We promise a 100% money back guarantee. If you have any questions, please feel freely to contact us, we will try our best to make you satisfied! Strong Viscosity --- Through new NanoTechnology and adaptable material it holds on all surfaces. 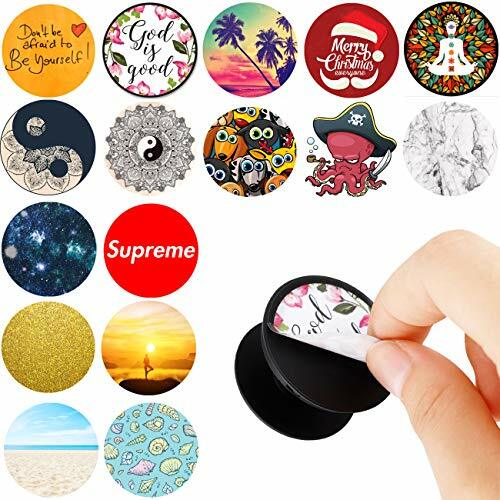 It can hold up to 1 KG (2.2 LBS) on a smooth surface so that you can arbitrarily paste anything, such as cell phones, keys, pens, decorations, wall hangings, kitchen tools, etc. Washable & Reusable --- When it gets dirty, you can wash it with water and dry it to regain its stickiness. DO NOT use any other wipes or detergent. Can be used for many times, and will not leave any residue or glue when removed. Easy to Cut --- Easily cut to any size and length you want! It can be stretched, bending and folded out of shape to meet your needs. 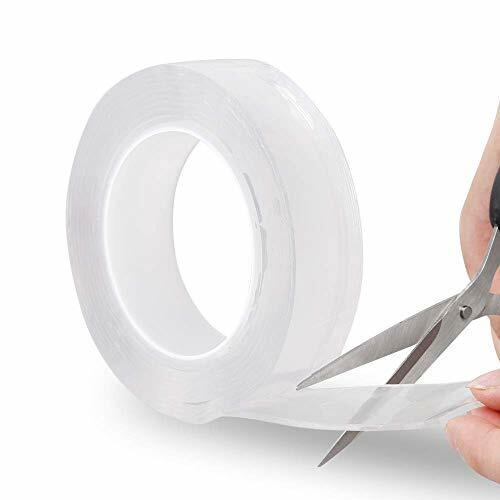 Double-sided adhesive --- Washable and reusable to keep items in place without slipping.but if the magic tape is wet, it probably can't stick still. please keep it dry when holding the object. The Plantronics mounting tape attaches the HL10 automatic handset lifter to your phone.